18 hole course designed by Arnold Palmer and Ed Seay. A realitivty flat golf course will help the golfer enjoy a unique experience at Teton Pines. The 18 hole course at the Snake River sporting club features 7,533 yards of golf from the largest tees for a par of 72. 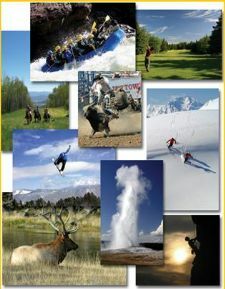 "Welcome to Youphoria" Grand Targhee is located in the Caribou-Targhee National Forest in western Wyoming. The base is at 8000 ft in the Teton Mountain range. Its about 42 miles West from Jackson Hole WY. Grand Targhee is known for getting over 500 inches a year with nearly 2000 acres with more than a 1000 reserved for Snowcat adventures. With 2,500 acres of tarrain and a 4,139 vertical rise Jackson resort is one you really don’t want to miss. Two distinct mountains, Rendezvous and Apres Vous make up this resort. This paradise offers some of the most challenging skiing and snowboarding. Lots of great hotels right off the premises.